I just got back from the Korean bowyer's place. My son and I went over there to pick up a horn bow. While attending to the requisite politenesses (coffee and talk about life in general), the bowyer wanted to show me a couple of his projects. He is working on three (at least) 'special' bows; he is reproducing centuries' old Korean bows. One will be a horn bow about 2.5 meters long, called, in Korean 'ye goong' or 'ceremonial bow.' Another is a somewhat smaller [large] horn bow and the third was most intriguing; it is a bow with a bamboo core, sinew backed, with bamboo on the belly (instead of horn) and mulberry siyahs. The siyahs are most interesting, as the wood came from a thirty year old cross-cut saw; they still have holes in them where a tightening wire was located (they will be shortened way below the holes later). It will be interesting to see how they turn out; the largest bow will take about two years, the next about a year and the last by this fall. This last bow, bamboo over bamboo, sounds interesting. In the book "Bow and arrow manufacture in Chengtu" there is a bamboo bow described with a shape like a normal Manchu, but no horn, just bamboo left exposed on the belly. May be something similar to your bowyer is doing. What is this bow's shape? Is the bowyer experimenting with the Chinese shapes? I imagine it must be less reflexed than a horn bow. 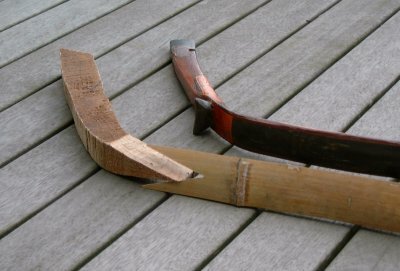 A 'bamboo bow' is a cheaper form of bow made for training. It is made of bamboo only with wood siyahs, with a little sinew if necessary. Its shape mimics the normal 'Manchu' Chinese bow. Actually, it's a repro of a Korean bow (I have a picture of the original, but my scanner is on the fritz). The shape is that of a Korean horn bow (right now, before sinewing, it is in a perfect 'c' shape). The core is a regular bamboo core used for horn bows and the belly is a slightly longer piece of bamboo; they are held together with eighty coats of fish glue. The tricky parts, according to the bowyer, is that, because of the bamboo belly, everything must be done in one try; the right thickness of bamboo had to be put on the belly, because he can't thin it down after and sinew must be put on at one time, because of possible moisture problems (which could loosen up the glue and disrupt the core). I have never heard of a Chinese bow made with two laminations of bamboo. But it seems from Dan DeProspero's book on Kyudo that bamboo lamination on the compressions side of the bow is normal. Perhaps this Korean bow was made under Japanese influence. I'll keep you updated. I thought the same thing about the belly compression but, then again, it was the type of bow that was used, for the most part, prior to the Koryo Dynasty; contrary to popular belief, most Korean military archers didn't use horn bows at all (too expensive and generally complex to use in fighting situations)-- archers were, often, also their own bowyers. This is the first time he has made any of these types of bows. I arranged for him to visit the museums where the originals are kept, and he got a private showing (here in Korea, you have to go through a lot of red tape). He made three Chinese bows previously (beautiful) this past year. The biggest problem he has with them is bending the siyahs; he does it all manually and it gives him a lot of fatigue. Still, he likes experimenting. Thomas, the siyahs at the knee were not bent in Chinese bows, at least according to the book above. A joining piece, called "knee" was spliced to limbs, then ears were spliced to that. All regular V-splices. Siyahs are quite thick in these bows, I coudn't imagine bending wood at such a sharp angle. Correct. You cannot bend the wood for the siyahs. There are two techniques used. One is to make two part siyahs (such as those in T'an's Report.) The other is to make the siyahs from a single piece of wood which naturally has the requisite degree of bend (Ju Yuan Hao's method). The latter are not difficult to obtain. The single, angled piece of wood needs to be broad enough to be sawn longitudinally to make a matching pair of siyahs. Ju Yuan Hao says that the grain of the wood must follow the requisite bend in the wood. 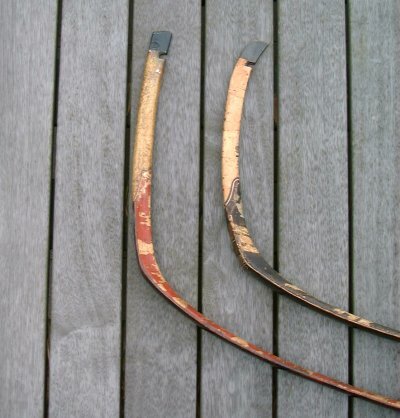 I have some old bows where the siyahs have a significant forward curve due to the grain of the wood that was originally used. It's possible at least some Chinese bows may have been like you mentioned. Referring to Stephen Selby's book, I can find no reference to it, either way. The Korean bowyer had in his possession a Ching Dynasty Chinese bow (borrowed from Stephen) while making his bows. I have a couple of them myself back in the States (although, I must admit I have never taken one apart). 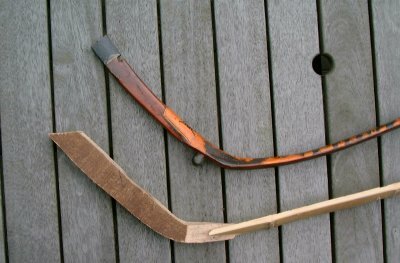 I also have a couple of large bows from Korea/China (hard to tell, as Korea used to have a design much like China's, as Korean bowyers are known to have made bows for the Chinese at one time); at least one of them I believe is from early to middle Chosun Dynasty Korea (about 300-500 years old). The only splice the Korean bowyer uses is the siyah to the core (just like in Korean horn bows). I'll ask Stephen about the siyahs. As mentioned above: either a single splice or two. There is a (poor) photo in the book of component parts of a Chinese bow. How about I scan it and send it to you? This may give the bowyer enough info how to make the bend. Soochow University Journal of Chinese Art History, vol. XI, July 1981. I understand this should be in English, the author is T'an Tan-Chiung. It is in Taipei, Taiwan. I have copies in English and Chinese: but the quality of the photos is just as bad. The following pics might help.